Charming Chic is a confusingly themed mobile slot that hides its virtues well. The mystical theme seems to be ‘things you’ll find in a new age shop’. So you get crystal balls (with ships in it? ), four leaf clovers (as you do), lucky horse shoes (a much needed ingredient in magical recipes) and your run of the mill mystical figures. What the lady bug is doing there we’re not sure. If you know, please post below to give us a clue. That said, this penny slot still has plenty to recommend it. For one, it’s a penny slot which brags that it gives you the most for your pennies – ie. high payout rate. The wagers may be small but bear in mind that a 1 penny bet can result in a $/£/€90 return. If you bet the 0.45 coin you could win $£/€450 – that’s quite a return. For second it has a decent 9,000 coin jackpot and a free spins bonus round with a 3x multiplier that makes this more than just a simple classic slot. Best of all, as the graphics are simple, it works well on most mobile and tablet devices. Wild Symbol: The Wild Maiden symbol will substitute all symbols, except scatter, doubling all your wins. Scatter: Two or more scatters will pay an instant win based on the triggering bet. 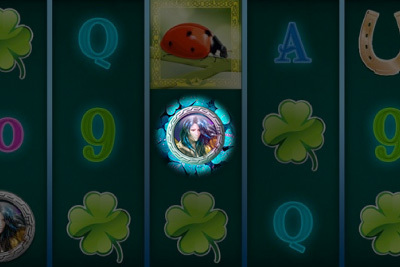 Three or more of these symbols also pays 15 free spins with a three times multiplier, which can also be re-triggered. The theme and sounds could be better, but you can’t deny the virtues of this simple high payout game. Charming Chic is a great one for beginners and penny slot lovers.